Ember Swift | » Wedding #2: With Buddhist Nuns' Approval? Friday, July 5th, 2013, Queer Girl Gets Married. For someone who had never planned or intended to get married—certainly someone who had never dreamed of my wedding day or felt fluttery when I saw wedding gowns glittering in store windows—the fact that I had not one, not two, but three wedding days is fairly ironic. I’ve written extensively about the first (and main) wedding in Guo Jian’s home city of Zibo, but ten days later we were up early again with a buzzing of anticipation for our event in Beijing. Of course, Guo Jian woke up testy and nervous and my in-laws were tense as well, especially since they’d had nothing to do with the second wedding and a lack of control always makes my MIL tight-lipped and edgy. They were staying with us, as well, along with my friend Cheryl, so all the jagged energy combined with full-time translation duties rolled up to meet me in the morning like an angry tidal wave. I had organized to have my hair done at the salon downstairs before the place even opened, paying a stylist double to come early. I hastily left the apartment that morning with a pleading request of my MIL to help me iron my dress while I was out. She gave me her silent, eye-darting consent to do so, which made me regret asking and feel completely crushed. The only thing I wanted that morning was a smile and a hug, some kindness or some joy—a little sunshine, perhaps. On the steps of the salon, the stylist arrived to jingle the locks open and found a foreign bride seated on the steps, slumped in tears. He didn’t seem at all surprised. I calmed down while my hair got curled and placed. It looked much more natural than the first wedding (read: not like a helmut head) and so I already felt a bit victorious when I was heading back to our apartment. Nevertheless, the wave of negative energy splashed out of the apartment into the stairwell when I pushed open the door of our apartment. Guo Jian was spinning and yelling, having lost something he was sure my MIL had deliberately moved on him. He was angry that I was so late but I had no idea he had wanted to leave so early. “We have to set-up!” he barked. He’d spent the previous evening setting up with friends so I was confused but chose to say nothing in response. They all decided to leave and pick up my parents at the hotel and then come back for me, which would give me fifteen minutes to get dressed and put on make-up. Breakfast was out of the question. My dress was still not ironed. Seems my MIL had been otherwise engaged with Gou Jian’s needs. I tried not to pout about it and when the door slammed behind them, I was relieved. But to say that I wasn’t feeling crushed once more would be an understatement. There was nothing I would have rather done that day than get back into my pajamas and play hooky on my own “second wedding.” I never knew it could be possible to feel unwelcome at one’s own wedding event—a burden, a nuisance, a hindrance to efficiency. These were the spiral of emotions that rushed towards me and I had to hastily build dams against flooding once more. I forced myself to breathe, held back tears while ironing, then consciously stared myself down in the bathroom mirror while I took long deep breaths and applied a modest amount of make-up. Eventually, I felt refuelled with determination to get through the day. 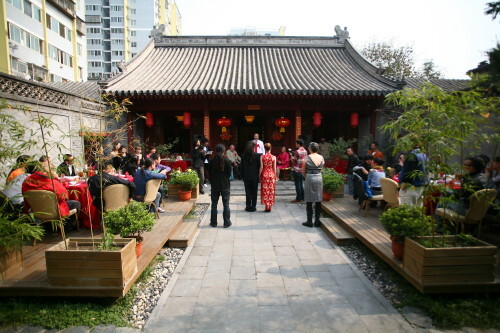 Our event was held at a traditional courtyard-style vegetarian restaurant in the beautiful, warm October sunshine. Blue skies formed the ceiling for the outdoor tables and the tables indoors were framed by wide open, carved wooden doors greeting the courtyard. There was hardly a separation between interior and exterior. The restaurant with its traditional buildings, deemed a heritage site and protected by the Chinese government, had interlocking courtyards, serene temples, green lawns and a sense of history in the stone pathways that I fell in love with when we first discovered it. The original site used to be a monastery for Buddhist nuns. Let me pause for a moment to reflect on this point. I know I must have been Chinese in another life, but I’m pretty sure I was also monastic in some capacity for lots of reasons that I don’t have to get into in this particular blog. Whether I was a monk or a nun, I resonate with Buddhism and always have. But the queer me in this particular lifetime also snickers a little at the fact that this site used to house Buddhist nuns. If I had been one of them, well… you can imagine that I would have been rather happy in my company of women, let’s just say. On the day that we booked the space several months earlier, I wandered around the grounds and found myself outside of a quiet temple at the back of the complex. There, I found myself wondering if my Buddhist sisters would have approved of my decision to get married (to a man!) on their sacred grounds. I touched the ancient tree tied with red ribbons and felt myself reasoning with them that afternoon. “I fell in love with him,” I thought, in my defense, “Please help me celebrate this love. I will still always be among you, even if I am not here in body.” The tree seemed to soften at my touch after that, or perhaps I just imagined it to be so, but I walked back to the table to find Guo Jian and smiled my consent to have the second event there. It felt right. Reminding myself of all of this brought more calm as we arrived, not to mention Guo Jian’s change of attitude in the car. He became jovial and lighthearted as we drove across town. We all arrived having left some heaviness of spirit under the tires en route. We were two hours early and I got to eat breakfast, finally, as Guo Jian put the finishing touches on the set-up. Then the friends started arriving and the event got underway. There was no choreography and no ridiculous MC in pink pants. Our Taichi teacher officiated the brief ceremony as we served tea to our parents once more. Afterwards, we got to eat the amazing food and then served up two delicious homemade cakes that were completely consumed by all in attendance. Overall, the event felt much more relaxed and intimate. The whole day seemed to breathe. There were only 70 guests, mostly made up of friends from Guo Jian’s community of musicians and artists after having spent a decade in Beijing. About 10 of the guests were my new friends in Beijing, all of whom continue to be part of my community to this day. Despite having had a hand in choosing the location, I didn’t actually have much to do with the planning of this event. Guo Jian was the main organizer. In fact, I’m pretty sure I was given the green light to eat breakfast that morning because I was getting in the way. I hadn’t planned the first wedding—his mother had. I didn’t plan the second wedding either—he did. Even though this second event was much more laid back, I nevertheless had to check in with a “director” to find out what was happening most of the time. I was still just a leading character in someone else’s play—my partner’s—only this time I had seen the script in advance, got to direct my own hair and make-up, and had approved the set design. One more wedding event loomed on the horizon, but mercifully wasn’t until December in Canada. We had six weeks to recover from the Chinese wedding whirlwind before having to think about it. What had I done agreeing to three weddings? Three times a charm? Wasn’t I married enough? “A wedding lasts a day; A marriage lasts a lifetime.” This was the saying that grounded me. Buddhist nuns would tell me to chill out and breathe.